I made a few random marks here and there this week - in drips and dabs, as they say. I finally just took a deep breath and finished it off this evening. Or do you call it what some of the older folks around here call it -- a "Piney Rose"? Sorry to have disappeared like that -- I've been sick since Sunday (nothing terrible) and haven't done anything to write home about -- or, at least to write to you guys about. Today I ended up staying home from work (which always feels like a WASTE) and by afternoon I was feeling a bit better and a whole lot bored, so I had to try doing a little something. I spent about 30 minutes laying some washes on this -- went and rested -- came back and did some squiggles in the background -- good enough for today. Hopefully I'll be able to carry through with this one without mucking it up too badly. The composition is, well, iffy, and I knew that from the beginning; but quite frankly, I felt kind of iffy myself at the time and decided that the painting could always be cropped. Composition by elimination, if you know what I mean. By the way, since it is kind of in an unrecognizable state, it is a peony -- actually one of the peonies that started from these buds shown earlier. 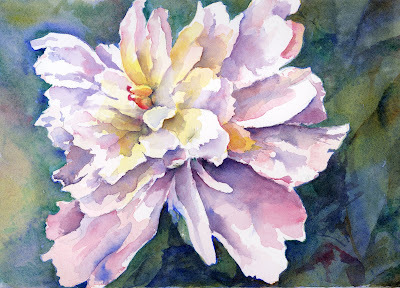 For a truly beautiful peony, if you haven't already seen my friend Zelma's wonderful painting, please go see it now -- HERE. 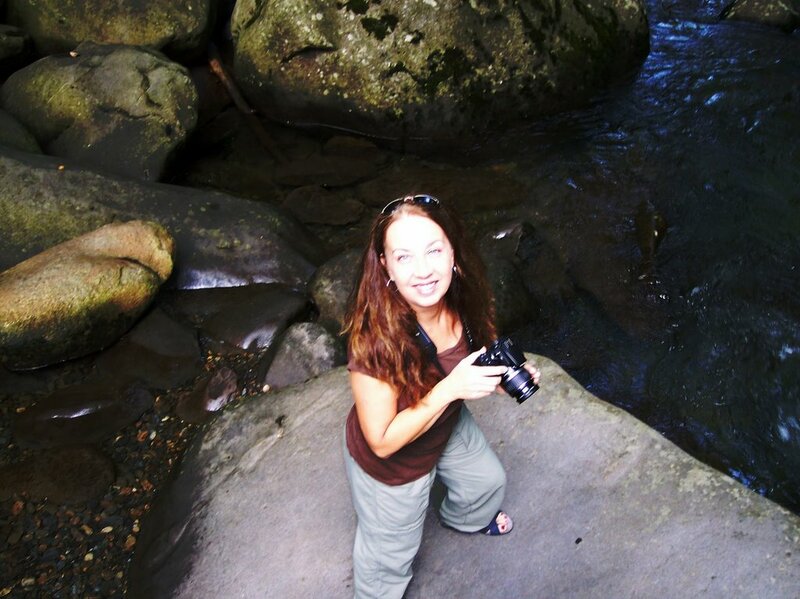 She is not only a great artist, but has a calm & steady hand, incredible focus, and more patience than anyone I know! P.S. I have done something everyday in May, despite everything, even if it is more doodles than sketches. They're around here somewhere. Don't ask me to go get them. Whew. Tomorrow I'll probably post the past 3 days and today's art efforts ... I think. Really, it all just depends on what I do with it today. Sigh. 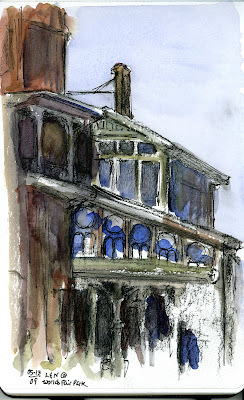 Sketching at the old L&N Train Station down by World's Fair Park yesterday. I used the carbon pencil again this time, and tried applying it a bit heavier for the darks than in previous sketches. Maybe a little too heavy in spots (yeah, one place shouldn't be dark at all, but I'm not going to be the one to point it out...), but it sure worked out for the deeper shadows! Hey, does that mean I'm not REALLY painting with just a triad? And then, cheating even more -- I tweaked it further with some ink. Speaking of triads -- this was a pretty good one for this type of painting, I thought -- French Ultramarine, Indian red, and Raw Sienna. The straight up colors are clearer and more transparent, and made for more interesting mixes with a wider range of darks than some of my earlier experiments. I think you actually have to know what this place is to even recognize what the objects are on the page. That's how you know it wasn't a great day sketching ... kind of like having to explain the punch line of a joke, right? 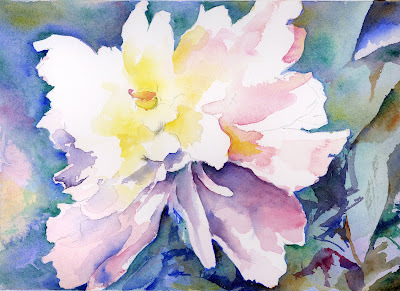 Started with purple pen, watercolor triad of New Gamboge, Permanent Rose, and French Ultramarine -- then touched up with carbon pencil and some more watercolor -- then, in a final fit of desperation, tightened up with .005 black micron and and accidental wash of phthalo blue in the back. The more I muddled with it, the more it got, well, muddled. Sketching from the car is hard. Only three colors is hard. The experimental sketches after work continue this week. 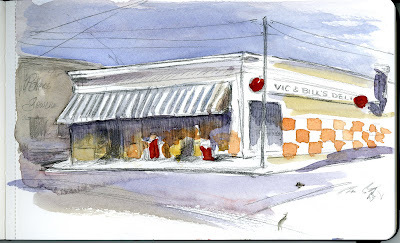 I had to take my car in for a little bit of work and when I went to pick it up, paused for a few minutes to sketch Vic & Bill's Deli across the street. This is the home of the famous "Vol Burger", heaping orders of huge steaming hot steak fries, and a really REALLY good Falafel. Sigh. And me on a diet... Oh well! I tried Friday's triad of cobalt and cad red and yellow ochre* again and am still not happy with it. Love how the cad red makes the nice accents, and I mixed a spot-on "University of Tennessee Orange" for the squares on the side wall (Go Vols! ), but I never could get darks or light value greys that satisfied me. And, as Forrest Gump would say, "that's all I have to say about that." I grabbed this shot earlier in the week when there was an unexpected break in the rain, using my handy-dandy little Sony CG6 that is usually in my bag. That little camera continues to surprise me -- I'm not sure that the good camera could have done a whole lot better on this one! Go visit Hey Harriet! and check out the links for the rest of this week's shadow play! 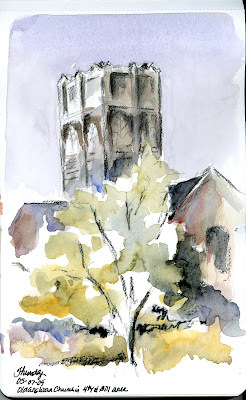 Yesterday afternoon I started this sketch of a church in the Fourth and Gill neighborhood in Knoxville, and finished the last wash on it tonight ... so, this will have to count for both days! I was off work today and we worked on the house (a much needed facelift!) with my parents' help. No time for drawing at all! This triad is Cobalt Blue, Cadmium Red, and Yellow Ochre. I like the greys and nice warm tones, but was surprised at how difficult it was to get a medium / light green. The skies are still cloudy and the day was overcast, but these colors made it look more like an early morning in late summer. I'm making notes of your suggestions for future triads, so please keep them coming! 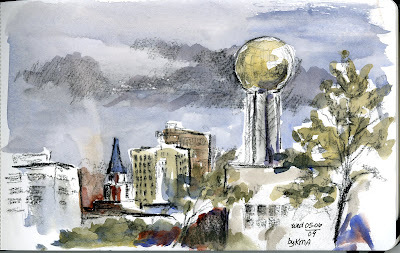 Sketched from the parking lot across from the Knoxville Museum of Art, while the rain fell, the clouds rolled in, and the wind rocked the car from side to side. I didn't even take the time to run into the museum today, thinking more that it would be smart to head home before all you-know-what broke loose! I was very happy with the sketch before the watercolor washes. Today I tried the triad of venetian red, french ultramarine, and yellow ochre. I really thought they would combine to make richer greys and provide much more color mixing options than the earlier triad*, but they felt weak together. I need to refer to yet another book I have checked out from the library (on Bill Renzulli's advice), "Blue and Yellow Don't Make Green" by Michael Wilcox to see what I missed here. Perhaps I should have used cobalt blue? So, to all, er, both, of my readers, what primary triads do you recommend? From the parking lot at Starbuck's this afternoon, still playing with the triad of cerulean blue, Indian red, and raw sienna. 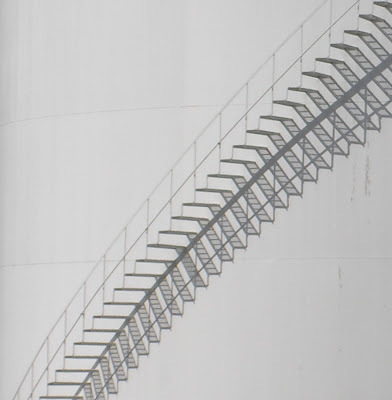 This wasn't where I'd originally intended to go after work for my quick sketch today, but the sun came out for a moment on the way home, and I detoured to some spots where I suspected I might find good shadows for Shadow Shot Sunday. The forecast is for rain, rain, and more rain all this week, and I had to grab the sun and shadow opportunity when it presented itself! Now. I have to clear up a little mistake from yesterday. 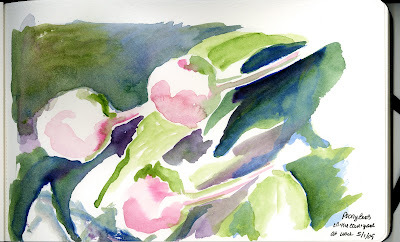 The book I referred to was "The Joy of Watercolor" ("...A Complete Course in Watercolor Using Your Sketchbook as a Workbook") by David Millard. The problem with art books is that I start out reading them and then, fairly quickly, get distracted by ... oooh ... the pictures! And in this wonderful book, clearly stated on page 8 -- yes PAGE 8! -- "Since carbon is soluble in watercolor to some degree, it can contribute rich darks in your washes in the form of a modest granular deposit." Hmmm. I'd say he pretty well DID TOO mention that the carbon pencils ran with a watercolor wash, don't you think? And on page 8 -- the saddest part is that pages 1 - 7 were title page and table of contents. Sigh. He basically said it on page ONE. A rainy and dreary day in Knoxville today! 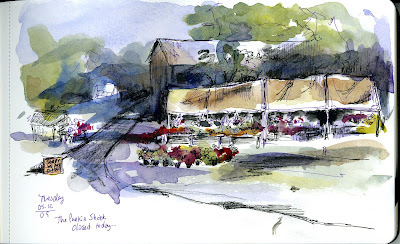 I'd decided that today I would stop somewhere -- ANYWHERE -- on the way home and sketch for the Every Day in May challenge. When I realized that I'd forgotten a pencil (and I really wanted to try pencil with a watercolor wash because of yet another art book I'm reading) I just stopped and Jerry's on the way home and picked up a couple of pencils, then drove two parking lots over and sketched the nearest building. I'd recently read a recommendation that carbon pencils rather than graphite are much better for sketches, so I chose a 2B carbon for this sketch. Even though the author discusses using watercolor wash over the carbon EXTENSIVELY I didn't see where it was noted THAT THE CARBON WOULD SMEAR with the wash! Nice to know for the really dark passages. Might have been nice to know before the sky wash ... although, since it was pouring rain this might actually be pretty accurate. 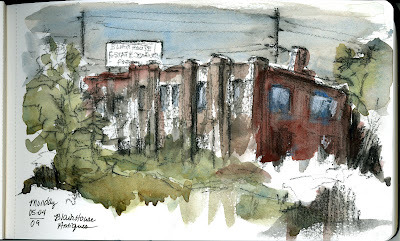 I'll blame the perspective on sketching in the rain while huddled over the steering wheel. Plan for the rest of the week? 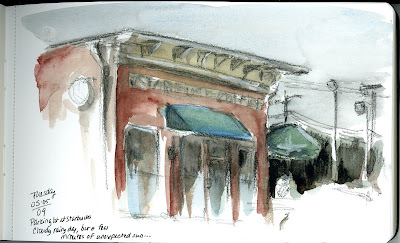 Stop on the way home every afternoon after work and sketch, then do the watercolor washes later on. Other plan for the rest of the week? I saw where Sandy was looking at playing with simple primary experiments, and thought that experimenting with triads was a great idea. This triad was cerulean blue, Indian red, and raw sienna. Lovely dull colors for a lovely dull day, don't you think? See the other shadowy characters over at Hey Harriet! So, I really AM doing Every Day in May, along with all the rest who are following French Toast Girl's lead. I'm just not doing anything spectacular! 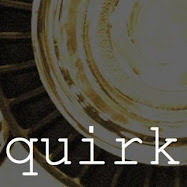 The goal is to get back into the groove of things, which is proving to be difficult already, as we are doing some major facelifting on the house right now, along with working full time. These peony buds are so pretty in real life, and photographs don't begin to give the right feel of them. I actually think I had this one RIGHT when I first did it. Then today, on the way up to the scanner, I went back and added the darker bits in the upper (viewer's) left corner, and all of a sudden it feels heavy rather than light and suggestive of the buds. Rats. That's what months of being out of practice will do for one! "...The point is you do have a choice. Charles Reid wrote a book titled Painting What You Want to See. My friend Don Stone said his title would be Painting What I Thought I Saw. I would include in this library I Couldn't See What I Was Painting." 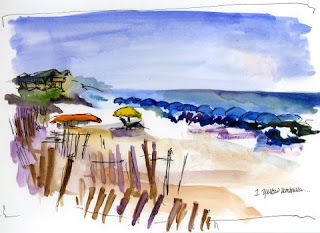 He talks about a way of organizing value in what he calls the "2 Against 1 Approach" where you paint your subject in 2 values -- light and medium, light and dark, medium and dark, whatever. The third value is what your main subject is against. I've simplified his explanation so much here that I've probably blown it, and my little painting proves that I haven't quite GOT it, but it felt like an "aha!" moment when I first read it. So far this is one of the best books on watercolor I've read in a long time. Yesterday I was thinking about my daughter in Florida and decided to do a sketch from a photo taken from one of our visits down there. I keep messing with the composition on this one, trying to get the yellow umbrella just right for a "real" painting, and this is the third or fourth version of this. It still isn't the one. Not by a long shot.